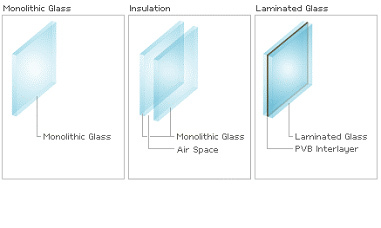 Laminated glass is formed as a sandwich of 2 sheets of glass, between which is bonded together with a transparent or tinted PVB interlayer under heat and pressure. Specifications︰ Thickness: 3+0.38+3mm, 4+0.38+4mm, 5+0.38+5mm, 6+0.76+6mm etc, could tailor per request. Size: Max. 1800x3300mm, could be produced per request. 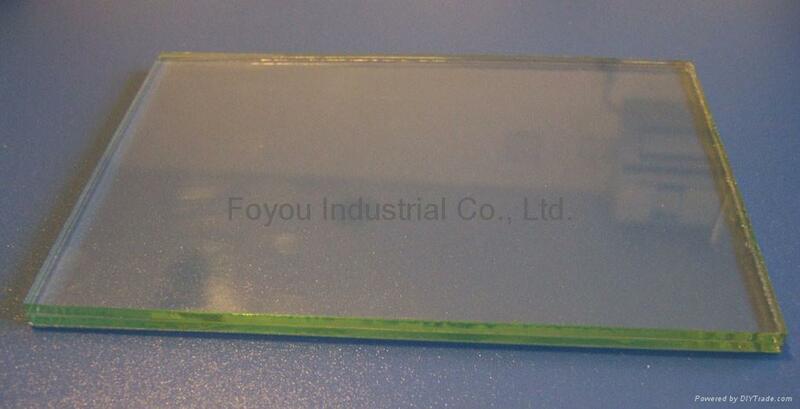 PVB Color: Transparent, Green, Blue, Grey, Black, Opaque etc. Advantages︰ - Extremely high safety: The PVB interlayer withstands penetration from impact. Even if the glass cracks, splinters will adhere to the interlayer and not scatter. In comparison with other kinds of glass, laminated glass has much higher strength to resist shock, burglary, burst and bullets. - Energy-saving building materials: PVB interlayer impedes the transmission of solar heat and reduces cooling loads. - Create aesthetic sense to buildings: Laminated glass with a tinted interlayer will beautify the buildings and harmonize their appearances with surrounding views which meet the demand of architects. - Sound control: PVB interlayer is an effective absorber of sound.